Rock salt replenishes negative ions in the air, which are reduced through industrial emissions, exhaust gases or cigarette smoke. By their reduction, the ratio of positive, negative and neutral particles becomes unbalanced and one feels more and more physically tired. That is why it is important to add a lot of these negative ions. Lamps made of rock salt can effectively improve the quality of air; adding freshness to it which tranquillizes us. 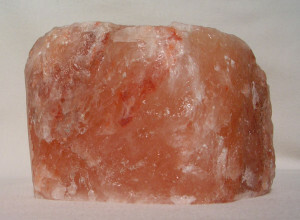 Salt lamps are made of crystals of rock salt, which contain other additives, primarily iron oxides. These additives add special orange or red color to the salt. The salt rock is mined in salt mines in depths of around 1000 meters. The lamps of salt crystals carry the history of Earth in them. The rock salt of these lamps comes from the Paleozoic period and is thus roughly 250 million years old. Salt in our everyday life is not considered something precious, but it still remains an essential substance. Without salt, life on Earth would not be possible at all. By a salt lamp we bring home a great energetic assistant and healer. Remarkable are their manifold strengthening, revitalizing and protective properties. 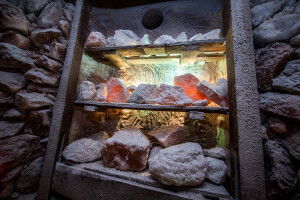 The effect of salt lamps in many ways reminds us of old healing methods, which used the effects of color, light, crystals and air in various combinations in order to bring body, mind, heart and spirit in harmony. In placing the salt lamps in space, it is necessary to be completely guided by spontaneous intuition. It is mostly the way in which one places the lamp exactly there where one needs it to be. However it is better to realize the whole width of the effects of rock salt and place the lamp accordingly. Salt crystal lamps are suitable for apartments as well as the workplace. They have positive influence on human organisms even without being lit since the salt crystals ionize the air. By lighting the lamp, the effects become even more prominent. It is advisable to put the lamps in rooms where there are computers or other electromagnetic devices. This lamp works pleasantly and amicably in entrance areas. It adds a warming aspect to the living room. It brings about calm and a feeling of safety. It purifies the air, enlivens dark corners, and brings optimism. The orange color of the salt lamp in dining halls stimulates the circulation of gastric and digestive juices and strengthens the appetite. It creates a comfortable atmosphere for collective dining. In the bedroom, it will take care of a good sleep. Lamps in bedrooms protect people against nightmares and bring deep sleep. The nursery is where a child sleeps, plays and works. Therefore, all the aforementioned examples are valid for it as well. A salt lamp is an ideal night light for children. All children like a calming light at night, which repels ghosts and ugly dreams. In a study, the salt lamp is a wonderful assistant. It increases the number of negative ions, which are reduced due to electrostatic charge and electro-smog. Thanks to the property of salt to bring order into chaotic energies and cleanse atmosphere, it is advisable to place it in classrooms. Colored light supports people in opening up to everything new and uplifts the spirit. For similar reasons do these lamps fit in doctors’ offices, infirmaries, waiting rooms and rooms for the ill. Beneficial effects of the lamp are manifested with asthmatics and people with allergies, whereby staying in rooms with the lamps their medical condition stabilizes and improves. In acute diseases of the upper respiratory tract, such as a cold, the flu or bronchitis, it is possible to leave the lamp on for the whole night. The ionizing effect improves air quality, which has a positive impact on the whole organism. It calms breathing, accelerates healing and alleviates uncomfortable manifestations of a disease.